Beulah is a small rural township on the Henty Highway and the railway line north of Horsham and Warracknabeal, in north-west Victoria. It is about midway between Warracknabeal and Hopetoun, which is the railway’s terminus. Like both those towns, Beulah is on the Yarriambiack Creek which flows northwards from the Grampians and ends at Lake Coorong, Hopetoun. Beulah was a few kilometres inside the vermin and rabbit-proof fence built from the South Australian border to Swan Hill in 1885, virtually encircling the Mallee district. Vermin (dogs and foxes) were to be entrapped north of the fence, and deprived of a food source provided by rabbits from the south. 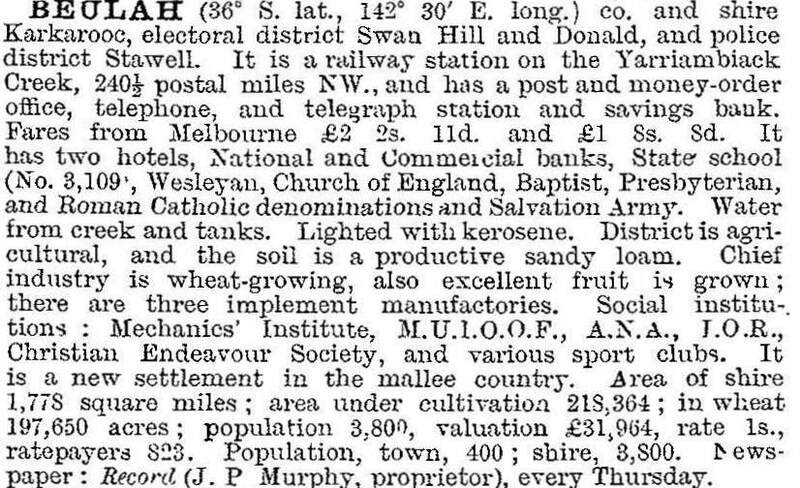 In 1885 Mallee blocks around Beulah were subdivided, and in 1891 the township was proclaimed. It was probably named after a farm selection owned by Alexander McKenzie and named Beauly. The railway was extended from Warracknabeal to Beulah in 1894, providing access to markets for Beulah’s main product, wheat. The Mallee lands were cleared by roller and burning, and rainfall was usually sufficient for good crops. An agricultural and pastoral society ran annual shows from 1896 to 1953. Beulah’s population stayed in the 400s from 1900 to the 1960s. The supply of livestock water from Grampians storages maintained sheep flocks for wool and fat lambs, in addition to cereals, providing good farm populations east and west of the town. Anglican (1905) and Lutheran (1953) churches were added, a hospital was opened in 1942 and a swimming pool was built in 1965. A one million bushel silo complex was built at the railway siding in 1963 to cope with increased grain production. The hospital was rebuilt in 1953 to a design by Peter McIntyre and enlarged in the 1970’s. Since then, however, Beulah’s population has declined by one third. On the west side of the township there are the Yarriambiack Creek and recreation reserve with a caravan park, swimming and tennis facilities. The school (12 pupils, 2014) is nearby. There are three churches (the Lutheran church having closed in 1983), a memorial hall which replaced the mechanics' institute in 1921, a small shopping centre, a hotel and a second reserve near the railway line. The railway station was closed in 1976. In September 2010 and again in January 2011 many parts of regional Victoria experienced widespread severe flooding. Parts of Beulah were inundated from Yarriambiack Creek but most of the town was saved by temporary levees. An emergency relief centre was opened at the Beulah Community Health Centre. In 2014 demolition began on the old Beulah hospital building.